I really liked Starcrossed but I haven't got around to getting this one yet! I'm so glad to know that you liked it even better then Starcrossed. Hmm, this Orion character sounds pretty awesome but I still love Lucas! Great review, Christy! WOO HOO!!!! I loved this one too Christy! I was definitely worried about the addition of Orion, I was not loving the idea of a love triangle, but like you said, it was well done and I just fell in love with him. It should be hugely entertaining to see where things go from here! Yay, so glad to hear this one is just as (if not more) enjoyable than book one! 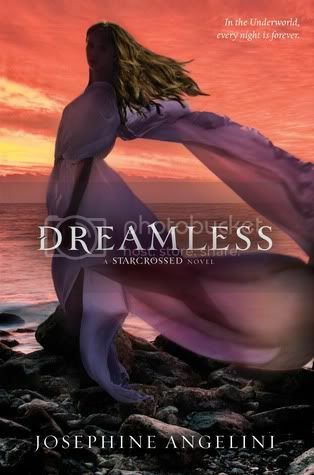 I really liked Starcrossed so I can't wait to start Dreamless. I am bit worried about the love triangle (I'm really not a fan) but hopefully it'll be okay. Great review, thanks! Orion definitely and easily became one of my favorite characters in this story!!! Loved it! I did had some problems with Helen and Lucas though... But overall it was a great sequel and I can't wait to see where this story will head with the next book! I love these characters! So excited to see them again! Orion sounds absolutely delicious. I don't mind love triangles if they're done well and I'm sure I'll have no problem falling in love with him! Very pleased that this book's a thrill from beginning to end. I can't wait! <3 Will definitely be reading it soon :) Great review! I love when you pick up a second (or third or whatever) book in a series and it's like coming home. Your favorite characters are there waiting for you. Have this one on my Kindle (I think?) --if I don't, I'm so reading this one!